My research interests broadly lie at the intersection of robotics, planning and statistics. I am interested in the problem of learning from experience, i.e., building systems that are capable of improving performance by observing their operation. For this, I look for approaches having strong mathematical and theoretical properties. Currently, I am working on heuristic-based graph search algorithms that exhibit such a behaviour. Prof. P.P. Chakrabarti is supervising my work on a new heuristic-based search algorithm that makes efficient use of islands. Under the guidance of Prof. Bibhas Adhikari, I am also exploring the applications of algebraic topology, particularly those of homology groups in graph search. 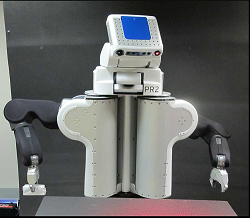 In the past, I have spent two wonderful summers in the Search Based Planning Lab at CMU working under the guidance of Prof. Maxim Likhachev on heuristic-based motion planners for robots such as the PR2 and humanoids.